Mountain Top Historical Society's quarterly publication, The Hemlock. James Hinds, (a/k/a Hindes/Hynds/Hains/Hanes/ -Haynes/Haines), a Puritan, was born in England around 1613-1617. By 1637 James had immigrated to Boston, where his name appears on a tax role. His age is listed as 24 and his occupation as cooper, a maker of barrels. Shortly thereafter, he moved to Salem, the seaside town north of Boston infamously known for its witch trials. He was declared a freeman upon his arrival there. In 1638 James married Mary Knight, who bore him five children. Around 1648 the family left Salem and moved to Southold, Long Island, population around 140 at that time. Benjamin Haines, the third son of James and Mary, was born on August 26, 1643, in Salem, Massachusetts. 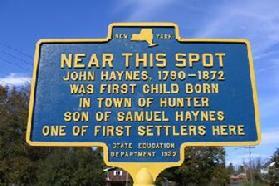 One of Benjamin�s children is our direct ancestor Samuel Haines, who was born in Southampton, Long Island, NY, the third of five children of Benjamin and his second wife, Johanna Jennings. Samuel apparently spent his whole life in Southampton farming and raising livestock and crops of all kinds. Around 1698, Samuel married Lydia (maiden name unknown), who bore him six children: Samuel II, Silas, Isaiah, Mary, Ruth, and our direct ancestor John (1713-1772). John Haines married Mary Frost around 1735. According to Jennie Haines Dunn, John and Mary moved to eastern Staten Island, where they had a small farm and John worked as a commercial fisherman. Around 1740, John and Mary moved north to Carmel, Putnam County, NY, among the first settlers in an area known as Southeast. John and Mary had at least 10 children, one of whom is a direct ancestor, Samuel Haines, born in 1746. Other children were John, Elisha, Shager, Martha, Sybil, Irene, Molly, Aaron, and Edward, who married Sarah Townsend, then Mariam Brewer (Brower). Charles Haines� bible states: �He (John) died by falling from a cart and the cart running over him� on December 6, 1772. By 1772 the Revolutionary War was brewing. The Hudson Valley, with its large non-English population, was an early hotbed of rebellion where violence exploded well before the outbreak of official hostilities. During the War, stories about Loyalist property being confiscated abound. Could this fact have led the Haines families, and others, to look for a safer place to live? Very likely. At that time, our Haines ancestors were tenant farmers on the property of wealthy landowners, some of whom refused to take the Oath of Loyalty to the new government that was evolving into the United States Government in 1779. As a result of this refusal, their land was seized and all rental agreements were voided. Essentially this came about because a large percentage of landowners supported the lawfully-established government of that time, the English Crown. A search of local histories, magistrate records, etc., looking for the name Haines among those accused or suspected of any misdeeds at that time, revealed nothing to support alleged Tory cowboy activity. However, in the New York In The Revolution, Supplement, a Samuel Hains and a Samuel Haynes are listed as British prisoners of war. �Of course, that these men were Tories could be true. But there is no proof of it. Not one of that Hains family was on the Tory lists of the day. Moreover, each man participated in civic activities within the new community: as pathmaster, on the school board, in charge of the poor, etc. Do they sound like men in hiding? Those early historians must not have known about the land development near Roaring Kill started by Jacob Tremper and Peter Van Gassbeek, all of it documented in deeds and other records. As to the pioneers having moved here because their property was confiscated, this could be so. Almost two-thirds of the land in lower Dutchess County, later Putnam County, lay within the Philipse Patent, and its owners were Loyalists. Tories were rampant. The same situation prevailed in Westchester County�with Loyalist land owners and Tories numerous. This did not mean a farmer, paying rent upon a Loyalist�s land, was a Loyalist or Tory. The significant point is that the State, now independent, confiscated all Loyalist lands. Anyone living on that land under a lease was entitled to buy his own acreage. The lessees, and many were small farmers, often did not have the cash to do so or did not wish to. Under which condition, they had to move. The advertising of land over in our mountain country at this approximate time, at a very low rent, with excellent water power and fine lumber, had its effect. According to Hains (Haines) family tradition�and it leaves a loophole for researchers to puzzle�those first two men, Samuel and Elisha, came by foot via the Esopus Valley and through Mink Hollow into the dark and gloomy mountaintops, the trees dense and many fallen, the wolves howling, the piercing cry of the panther shrill upon their ears. At a point on Gooseberry Creek, the north branch of the Schoharie, where beavers had built a dam, near the old Tannersville railroad station, they built a shelter and stored in it cured deer meat. Samuel Hains (Haines/Haynes), born in 1746, an original settler, married to Sarah Townsend, was granted the first lease to a permanent settler on the mountaintop in 1791 in Great Lot #25, Lot #4, comprising 175 acres of land. Samuel built his home on South Main Street, Tannersville. Most of his seven children received leases on land and built homes in and around present-day Tannersville. Samuel�s children married into the Blodgett, Townsend, Merritt, Underhill, Birdsall, Bloomer and Goodrich families. 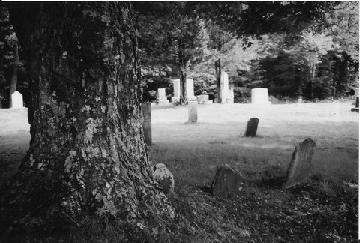 There are two rough fieldstones, now overgrown by trees in the Tannersville Evergreen Cemetery, with the initials SH and SRH carved in them, thought to be the graves of Samuel and Sarah Haines. This article is continued. Please see "Hemlock Article Page 2".